Did you know almost 50% of economic crime against a company is committed by internal parties? Download our police check eBook for a guide on how to protect your company culture, revenue and reputation. 2 in 3 are unaware of the outcomes of the Financial Action Task Force review of Australia’s AML/CTF legislation. Download our due diligence eBook to see how your business could be affected. 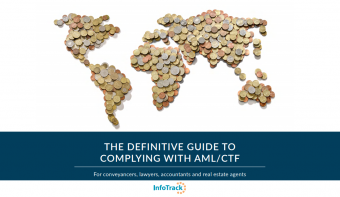 In November 2016, InfoTrack conducted a survey on professionals across Australia on their AML/CTF due diligence and how Tranche 2 would affect them if implemented. View the results. 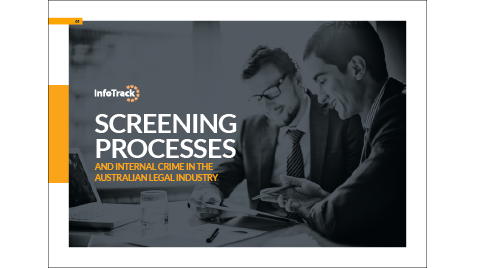 InfoTrack and Lawyers Weekly surveyed over 200 legal professionals to determine the prevalence of internal crime and gain insight into existing screening processes. Download the report. Are you protecting your company's culture? Watch to see how you might be at risk. InfoTrack and Lawyers Weekly hosted a round table on the need for better police check and screening processes in the legal industry. Listen to the podcast. 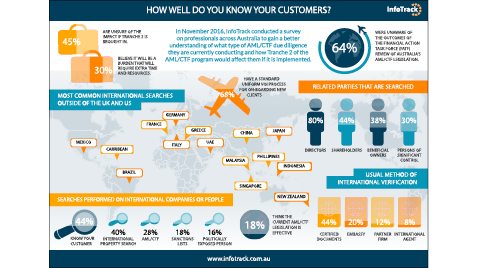 InfoTrack conducted a benchmarking survey of Australian professionals to understand the attitudes toward Australia’s compliance landscape and international due diligence procedures.View the infographic. 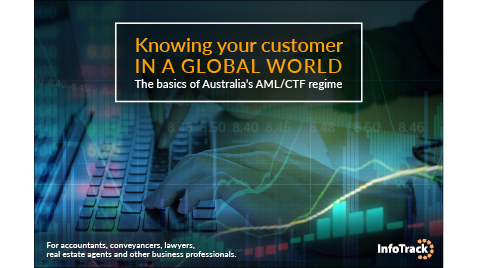 Find out all the answers from leading AML/CTF experts before Tranche 2 comes into effect. Download the eBook. 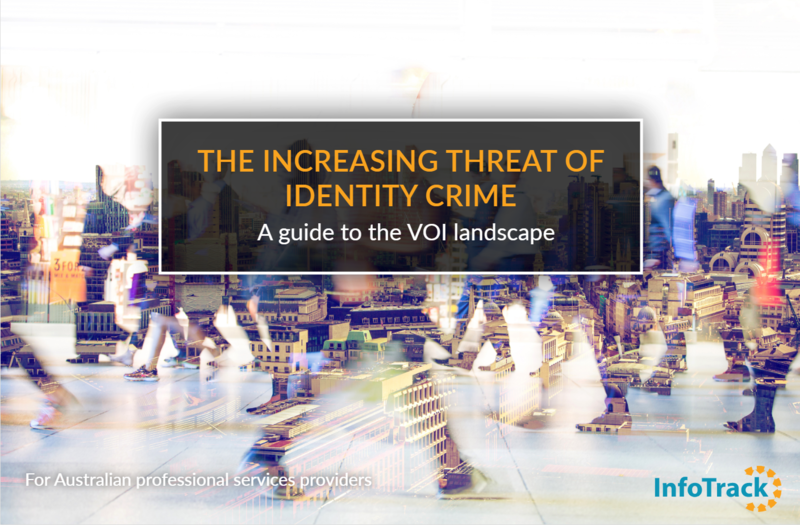 Learn about the current VOI legislation in Australia, read about real-life cases of identity fraud, know which common red flags your clients should look out for and more. Download your copy now. 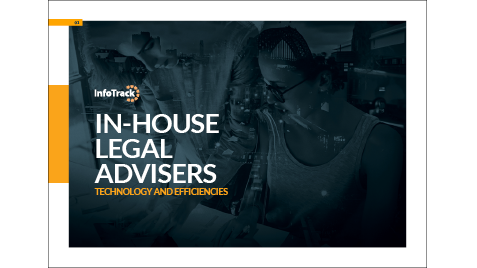 InfoTrack CEO John Ahern sat down with several legal industry leaders to explore how technological innovation is changing the legal industry. 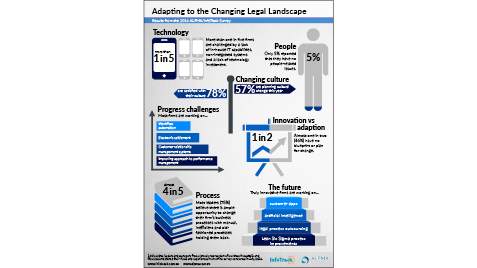 Download the eBook to read how it is affecting law graduates and the wider profession. 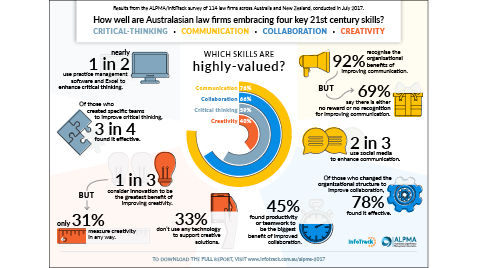 The ALPMA/InfoTrack research measures how well Australasian law firms were embracing the key 21st century learning skills of creativity, critical-thinking, communication and collaboration. Download the results. Of those who created specific team to improve critical thinking, 3 in 4 found it effective. Download the infographic to see the ALPMA/InfoTrack 2017 survey highlights. 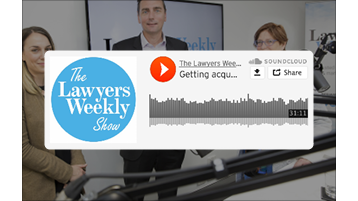 InfoTrack and Lawyers Weekly surveyed over 100 in-house legal professionals to look into what kind of tools they're using to increase efficiency and make the most of their resource. Download the report. 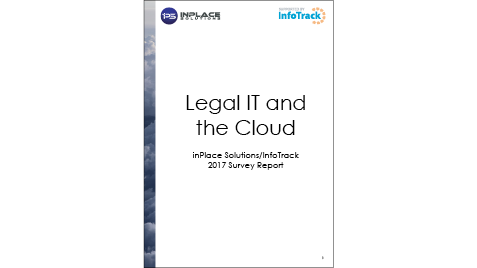 InfoTrack and IPS Solutions conducted their second annual Legal IT technology survey of practitioners across Australia. Download the report. 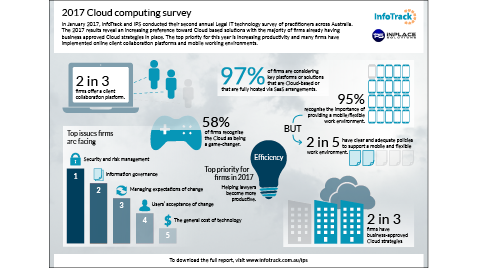 InfoTrack and IPS Solutions conducted their second annual Legal IT technology survey of practitioners across Australia. Download the infographic to see the key findings. 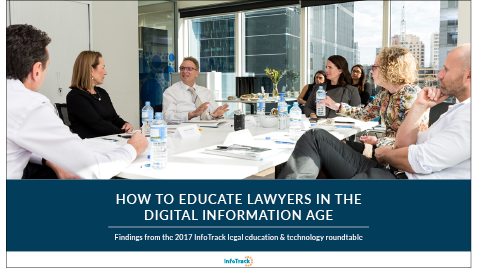 InfoTrack and Lawyers Weekly hosted a round table on the rapidly changing role of in-house legal teams. 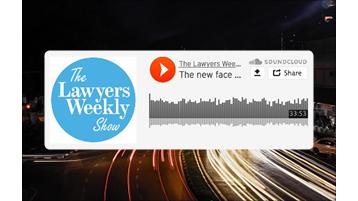 Listen to the podcast, 'The new face of corporate counsel', to hear the findings. 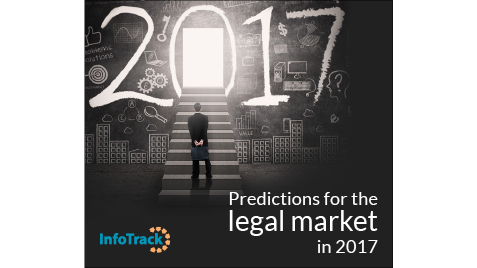 This eBook explores predictions for the Australian legal market in 2017 from a broad cross section of industry experts. Download the eBook. 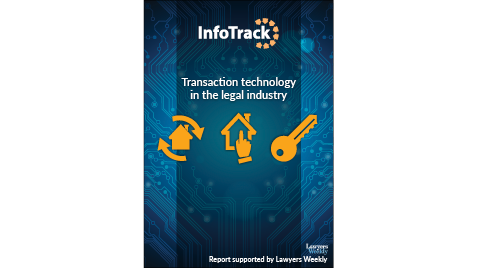 InfoTrack and Lawyers Weekly surveyed over 400 Australian legal professionals on adopting new technology. Read the report to find out the main benefits and challenges. 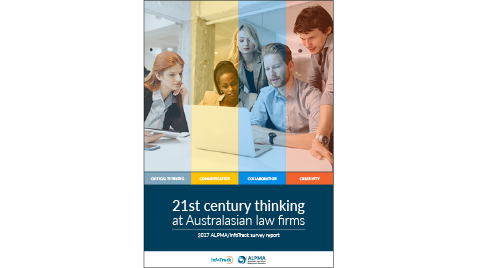 The ALPMA/InfoTrack 2016 survey shows how well the Australian legal industry was adapting to change and driving innovation. Download the results. 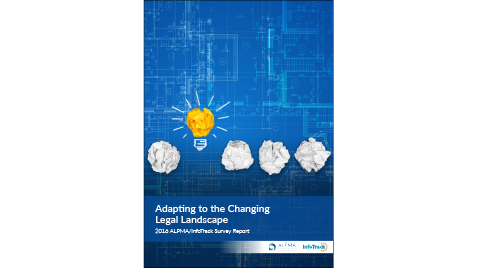 78% of firms felt held back by manual, inefficient and old-fashioned processes. Download the infographic to see the ALPMA/InfoTrack 2016 survey highlights. 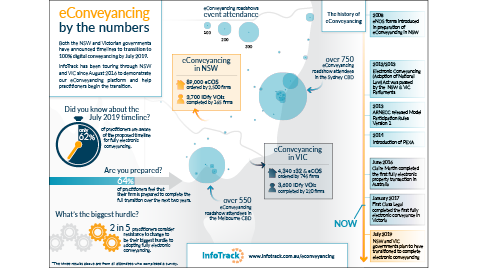 Both the NSW and VIC governments have announced timelines to transition to 100% digital conveyancing by July 2019. Download the infographic to see how the industry is reacting. 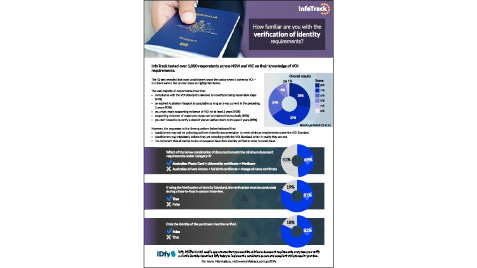 InfoTrack tested over 1000 respondents across NSW and VIC on their knowledge of VOI requirements. Download the results to see how they fared. How can you reduce hassle, save time and avoid printers & scanners? All you have to do is SignIT. Ever dreamt you could execute a Contract for Sale in under 30 minutes? Now you can, through InfoTrack’s e-Conveyancing platform. Visit our blog or podcast channel.